Mike Kingery toiled in the minor leagues for six and a half years before he got called up by the Kansas City Royals midway through the 1986 season. The Royals traded him to the Mariners, and in 1987 Mike Kingery played his first season of professional baseball entirely outside the minor leagues. The outfielder would log 10 seasons in the majors, and most players who manage to stick around that long don’t have to bother with the minor leagues after their earliest years, but after 1987 Kingery kept getting sent back down to the bushes, splitting time between there and the majors in 1988, 1989, 1990, 1991, and 1992. In 1993, at the age of 32, he spent the entire season in Omaha, the Triple A affiliate of the Kansas City Royals, whom Kingery had circled back around to after stints in San Francisco and Oakland. He hit .263 for Omaha with a .325 on-base percentage and a .411 slugging percentage. It was the last of his 13 seasons in the minor leagues, and if you had to guess what happened next based only on Kingery’s lifetime minor league stats, you’d have to assume that it was the last of his seasons in professional baseball anywhere. 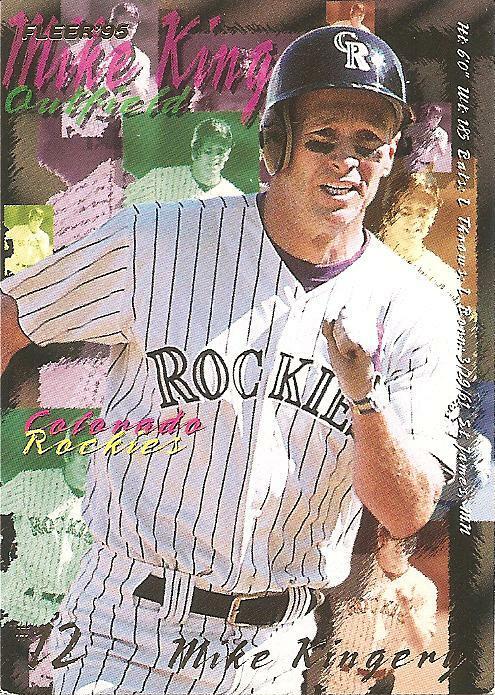 Instead, he hooked on with the Colorado Rockies and, in 1994, the year just before this card came out, Mike Kingery suddenly was able to hit practically everything thrown to him. He started showing signs that he was locked in during limited plate appearances in April, became more or less a regular in May and saw his numbers start to tail off, but then he caught fire in June and stayed blistering hot the rest of the summer. On August 11, 1994, Kingery was batting .349, behind only Tony Gwynn and Jeff Bagwell in the National League batting title race. In this 1995 card that spotlights the outfielder’s career year, some anxiety seems to be ingrained in Mike Kingery’s face. He’s digging for an extra base, clearly, and he carries with him in this effort all his many years of experience as a journeyman clinging to the edges of major league rosters. You get thrown out trying to dig for an extra base and maybe you get a “nice hustle” from the manager, and then again maybe you get a bus ticket back to Tacoma. There’s not a lot of margin for error. There’s no way to know whether Kingery made it safely to the base he was trying for in the photo on the front of the card, but if his stunning 1994 effort could be thought of as being encapsulated by the electric moment of tenuous gain on the front of his 1995 card, then it can be said that he would never arrive at the base he was trying for, not officially, anyway. Hands would be thrown in the air, time called, and everyone on the field who had been running and whirling and throwing would suddenly slacken, looking around confused. This was, of course, the season that never really occurred, or occurred in truncated form, like an apparent triple in which time was called and the game was ended while the runner was rounding second and digging for third. It was a season that ceased with a labor disagreement, no playoffs, no World Series, the usual end punctuation for the season not an exclamation point but a question mark. The question mark attached itself to the season itself and to everyone and everything in it. Some of the individual uses of this traveling question mark are more well-known than others. Would the Montreal Expos have won the World Series and maybe then never left Montreal? Would Matt Williams have broken the single-season home run record? Would Tony Gwynn have hit .400? I doubt many people have wondered about Mike Kingery’s career year, but because it came during 1994 it has a question mark clinging to it, too, just like everything else that occurred that year. Applying the enigmatic doubt-flecked career apex caught on this card to the fortunes of the 2011 Colorado Rockies, I’ll say that the Rockies will sail most of the way through the season on a wondrous roll, and then, in August, it will be as if a plug is pulled, all the electricity of the hot streak instantly gone. Digging for third, they will be thrown out. That is 1 ugly baseball card! I am guessing that he was a high draft choice in any Strat-O-Matic leagues based on the 1994 season.